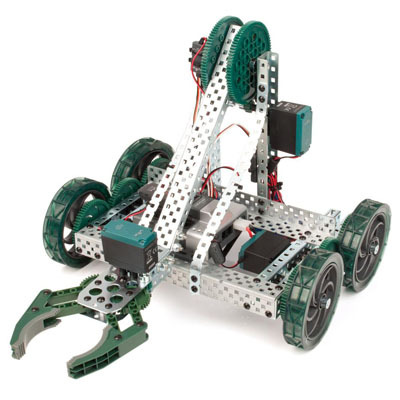 This tutorial will guide you through basic programming of the VEX Clawbot. This tutorial is intended for developers with some programming experience, but with little to no experience with the PROS library. If you haven’t programmed before, we recommend checking out all the “Introduction and Basic C Features” sections of this tutorial series; you may also benefit from the “Pointers, Arrays and Strings” sections as well (although they aren’t as pertinent). We modified our clawbot to include a quadrature encoder on the lift arm. We plugged the top and bottom ports into digital ports 2 and 3, respectively. 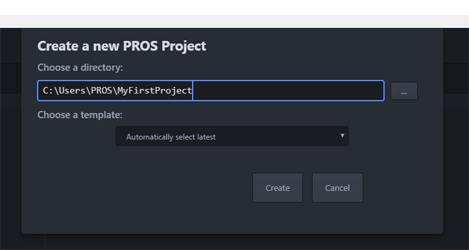 With Atom started, you can create a new PROS project by clicking the PROS menu, then click Create new Project. Create a directory that you’d like to keep the source files for your Clawbot project. We’re creating ours in C:\Users\Elliot\dev\Clawbot. Pick a directory to create the new project in and click Create. The PROS CLI will now copy the latest kernel template into the specified directory and Atom will open it. By convention, the opcontrol(), autonomous(), and initialize functions are separated into separate files (opcontrol.c, auto.c, and init.c). They could be all in the same file, but it can be helpful to organize your functions into multiple files to keep things from becoming messy. Let’s begin by writing a basic “arcade” control for the clawbot. In arcade control, the vertical joystick values control the forward/backward speed of the robot and the horizontal joystick values control the rotation of the robot. Atom will open src/opcontrol.c for you when you create a project, but if it is not open then you will need to open it by navigating the directory tree on the left panel. The template opcontrol.c file contains a simple infinite loop and documentation to help remind you what opcontrol() does. PROS offers functions to perform common tasks associated with programming robotics. To program basic arcade functionality, we need to be aware of two functions: one to get the joystick input and one to set the motors to a speed. Sets the speed of the specified motor channel. It’s considered good practice to comment your code. Commenting can make it easier to understand the original intention of code when you have to look back on it months later in the middle of the competition and everything’s broken. Next, you will need to compile your project. Compilation converts your code into instructions the Cortex can understand. There are typically four stages to compilation. The following paragraphs explain abstract complicated technical systems. This introduction to compilation is intended to give some justification for the compilation process, but is by no means complete. This information is not necessary to program with PROS, but may be helpful for some. Lines starting with a # are interpreted by the preprocessor as commands. These commands can include other pieces of files (#include), execute basic macro logic (#ifdef), replace text (#define), and more. The goal of preprocessing is to reduce duplicated code. For instance, to call the PROS API, all of the function declarations need to go in the source file. Using a header file can simplify this operation by writing all of the function declarations in one place, and just #include-ing it to reference those function declarations. The next stage of compilation is to translate preprocessed code into assembly instructions that the ARM Cortex-M3 processor can almost understand. Assembly code is human readable and reasonably converted into a language that the processor can understand. The assembler translates assembly instructions directly into machine code (called object code or objects). These files aren’t considered human readable and can be interpreted by the processor directly. The final stage of compilation is linking. Objects contain pieces of machine instructions, but may not be complete. For instance, when compiling your source files, the PROS API are not directly incorporated into your object code (merely references to the PROS API functions, as specified by the function declarations). The Linker will incorporate and rearrange all the difference object files (and libraries) into one file that can be interpreted by the processor. To compile code within Atom, press Ctrl + Shift + P to bring up the Command Palette. You can start typing the command you wish to execute, “Build: Trigger”. You should also notice that it will display the available shortcut keys to execute the command. By default, triggering a build can be done by pressing Ctrl + Alt + B (⌘ + Alt + B) or F9. If you have unsaved files, Build will prompt you to save those files. You should always save before building. Now that you have compiled a binary file that the Cortex can understand, you need to upload it to the microcontroller. Within Atom, click the ‘Upload to Cortex’ button in Atom. This process will upload the binary the compilation process created (bin/output.bin) to the Cortex and begin running it. If you followed these instructions correctly, you can connect a joystick to the clawbot and drive it using arcade controls! In this section, we’ll introduce the subsystem module methodology. When developing code for complicated robotic systems, it’s extremely helpful to abstract away the necessary steps to perform actions on a system. For instance, to set the speed of a 4 motor chassis, you may need to set the speed of the front left motor, the rear left motor, and so on. You might just have four motorSet() calls every time you want to set robot’s speed, but what happens when you add another pair of motors to your chassis, or collapse your left and right sides onto two Y-cables? You would need to comb through all of your code to find all of the times you set the chassis speeds and adjust those calls accordingly. Similarly, you may want a level of abstraction for getting sensor values - what happens if you decide to switch from quadrature encoders to integrated motor encoders? Writing a function such as chassisSet() can help mitigate this problem. Additionally, you cannot write your chassisSet() function in multiple source files, so you need to create a single source file and be able to incorporate it with opcontrol.c, init.c, and auto.c. The subsystem module methodology is a standard way of organizing these sorts of functions. We define a subsystem as a major component of a robot: chassis, lift, intake, and claw are some common subsystems. We’ll write our abstracted subsystem functions in a file like src/chassis.c and put our function declarations in include/chassis.h so that way we can call our new functions. Let’s modify our existing operator control to use the subsystem methodology. We’ll begin by creating the header file containing our function declarations. You can create a new file in the include directory by right clicking include and clicking “New File”. We’ll name our file chassis.h. A new empty file is created for us. Header files contain declarations, but not typically definitions. They are a way to describe what resources are available to you. It should be clear that congregating similar pieces of code into a C source file and a header file for other source files simplifies and organizes your code. Then, in opcontrol.c, the only file we would need to #include is main.h. In future source files, we would only ever need to #include "main.h" in order to get access to all of our robot’s subsystems’ functions! Our drivers requested that they be able to use the trigger buttons to control the lift. At this point, complete the lift submodule on your own just like we did for the chassis and claw. If you’re having trouble, take a look at the complete Clawbot code sample at the bottom of this page. Depending on your motor, you may notice that the arm falls back down when stopped mid-raise. This can be alleviated by applying some power to the motor when no buttons are pressed (instead of 0), or by using a feedback control system such as PID. -Congratulations, you have completed your first PROS program!